Well, things get really real really fast for Jesus after his baptism! Matthew makes it sound like he went straight out of the Jordan river and went walking into the desert to be tempted by Satan with water still dripping from his chin! Whether it happened quite that fast or not, I don’t know, but I think it’s clear that Matthew wants us to feel the connection between his baptism and his time in the wilderness. Especially because it’s easy for us to miss this element in our own baptisms? We come to church and see babies baptized and think, awwww, how cute! Some babies cry, some squeal, some sleep, some allow for other bodily functions to take place, point is, we all leave a baptism feeling good about what just happened! And we should! But I think because we baptize babies in this church, who don’t really have much to worry about in this world while they’re babies, it lulls us into a false sense of security. But if we think about it, we know that our baptisms don’t make our lives any easier. What I mean by that is, our baptisms don’t promise us a better life, or a life without pain, or a life without trials and tribulations. And this story of Jesus’ temptation in the wilderness, right after his baptism, is a good reminder of that. 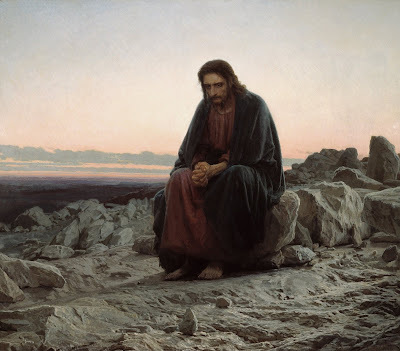 Without even allowing Jesus take a breath, to process what had just been done in his baptism, he is rushed into the wilderness to have a showdown with the devil himself. Now, most Bible translations, including the one I read from, use the word temptation. However, scholars have pointed out that a more accurate word would be test, rather than to tempt. What’s the difference you might ask? Well, one commentator put it this way, the difference is in the motive of the one doing the tempting or testing. A tempter doesn’t have your best interests at heart, and is hoping for you to succumb to the temptation. However, a tester may very well have the best of intentions for you. In fact, the point of a test is to make you better than you were before! Even when the test is failed, something is learned, growth occurs, and we are better for it. Now, why is this important? Well, I’m not sure if you caught this but our story today began by pointing out that it was the Spirit, God’s very own self, that led Jesus out into the wilderness to be tested by the devil. And we all know that God doesn’t tempt people or lead people into temptation, but test people, hmmm, I think I’m ok with that. But again, not in a vindictive or callous way, but for the betterment of God’s people, to make God’s people stronger, wiser, more trusting than they were before. Thankfully, we don’t send our baptized babies out into the wilderness to be tested! We’d never get any new members that way! Now, I know, I’m treading on shaky ground right now. Because there’s a fine line between saying that God tests us and believing that God is behind all the horrible things that happen in our lives. You should know me by now, I am not in any way saying that. But, we get tested all the time don’t we? Whether it’s by God or each other or just by life itself! The point here is not to put blame on anyone when we are tested, but to pay attention to how we come out on the other side of that testing, keeping in mind, that the whole purpose of our baptisms is to be continually transformed into something new over the course of our lifetimes. So, when we are tested, the question is not, who’s responsible, but, did it make us stronger? Did it make us more trusting in God? Did it make us wiser? Did it makes us more loving? Or whatever you think was being tested. Let’s take a closer look at Jesus’ tempting by the devil. The first thing to notice is that the Devil waits for Jesus to be at a weak point. When he starts tempting him, Jesus is already extremely hungry. And isn’t that always the way. How many times has life tested you when you are already in a tough spot? I don’t know about you but it happens to me quite often. I’ve learned to not ask, what next?, because life can show real fast that things could always get worse. Sometimes the real test is how we handle stress when we are already in a vulnerable position. For Jesus, it was battling the stress of hunger and probably thirst and fatigue if he was just out in the elements. But this first temptation was about more than just physical hunger. What was really being tested here was Jesus’ perseverance, and how self-serving he was. How long was Jesus going to last through these temptations? Because once he fell to one, that was it. If he had turned those stones to bread and taken a bite, there would have been no temptation number two or three. The game would have been over. And the Spirit would have then known just how long he could last. But more than that, the Spirit would have known if Jesus was in this for himself or not. You see, Jesus must have known that this was more than just a test of his resolve, but that there were bigger plans at work here, that his life was somehow intertwined with others. And so, if he quit then, after one temptation, to serve himself some bread, then the Spirit would have known that if he couldn’t handle this, how could he handle what was to come? As you think of the many ways that you have been tested over the years, the trials and tribulations that you have had to endure, which ones tested your perseverance? Which ones tested just how self-serving you were going to be? Those of us who are parents are faced with this test all the time aren’t we? Will I buy those jeans that I really need this pay or will I pay for that softball clinic that my kid wants to go to? And those tests are the easy ones. What about something like, do I go to Starbucks or increase my giving to my favorite non-profit once a week by five bucks. Oooh, for some of us that hits us right where it hurts! But the big question is, how did you do with that test? How did you come out on the other side of that test? And I don’t mean, did you pass or fail it. I mean, did you learn anything about yourself? Did you grow, stretch, and thereby, become a better human being for it? Jesus’ next test was all about his ego. The devil asks him to throw himself down from the temple roof and let the angels catch him. Now, Jesus rightly tells him that we shouldn’t test God like that. But Jesus was also tested with the question of, just how important do you think you are Jesus? Do you think so highly of yourself that you’d risk your life to see if God will come to your rescue? Just how big is your head Jesus? Fortunately for us, Jesus was a humble human being. He realized, again, that this wasn’t all about him. But it was about God’s world that he was called to serve. This wasn’t about the fame he would receive if he would survive a very public fall from the temple rooftop. This wasn’t about using his divine influence. The Spirit wanted to see if Jesus’ ego needed to be checked, and thankfully, it didn’t. Which leads us to inquire about our own egos. When are those times when we are tested to see how big of an ego we have? How do we do with those tests? This question gets really interesting when we think of this in a communal sense, rather than individually. Which, as we learned last week, is what this baptismal life is all about right? Community! So, think of the ways that we as a congregation might get hung up on our own ego? Are there times when we are tested to see just how highly we think of ourselves over others? Are there times when we are urged to rethink our ministries based on how much they are serving our own interests versus the interests of others? Or maybe in our relations with others that are different than us, that believe differently than us, or worship differently, we are tested to see how high and mighty we think we are over them, or how our way is the right way or the best way! Finally, the devil asks him to worship him instead of God, and the reward will be power over all the nations of the world, earthly power. In this temptation, Jesus’ loyalty is tested. And again, Jesus comes out on the other end of that test, proving that his loyalty is to God, and not to anyone else, not even himself. Are you hearing a common thread throughout all these temptations? Even though each test is about something different, perseverance, selfishness, ego, loyalty, Jesus always seems to come back to that same place—that this is not all about him. And this is Jesus we are talking about, the savior of the world, the ruler of the cosmos! Even he needed to acknowledge that this wasn’t all about him! I won’t bore you with a lesson on the history of the church but for many centuries, the church had fallen to these same temptations that Jesus faced. For too many centuries the church had thought too highly of ourselves, thought we knew better than everyone else, thought we had all the answers, and then used that pride to lord it over others who we thought were less than. Now, you may be thinking, well we didn’t have any part of that pastor, Bethlehem is only 75 years old! Well, that may be true, but isn’t our job to clean up that mess, whether we like it or not? Maybe that is our big test of the ages. Maybe we are being tested, right now, to see if we can clean up that mess. To make sure that the world knows that the church is here to serve, not to be served. That the church is here to sacrifice in order to make the world a better place, not here to consume. That the church is here for the worlds benefit, and not our own. And that we don’t have all the answers, nor is our way of thinking or doing the right or best way. We are living in an age where the church is not thought of in the same way people did in the past. People are not attending like they used to. And if we wonder why that is, maybe it’s time to read up on some church history, and ask ourselves if there are any wrongs that need to be righted. Could that be our wilderness that we are being called into? Could the Spirit be calling us from our baptismal waters, with water still dripping from our chins, into a wilderness where the church is no longer number one, no longer the best game in town, no longer the one in power? Could that be our test? That in spite of all that, we are still called to persevere in the same mission that the church has always been called to—to love as we have been loved. If so, may we be ever reminded of God’s faithfulness to us, to never leave our side, and love us unconditionally, no matter how we come out on the other side of our tests. Thanks be to God. Amen.